Souper Salad is a great place to have lunch, and with these Souper Salad printable coupons, you can have lunch without breaking the bank. Seriously, less than $7 for an all you can enjoy meal?? That is a bargain! You can have an array of fresh salads, soups like Italian Wedding, a baked potato, and of course ice cream for dessert. Souper Salad used to offer a military discount. I believe it is by restaurant now, so have your military ID handy and ask when you are paying at the register. It does not appear that Souper Salad offers a senior discount at this time. 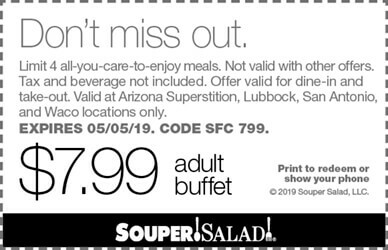 However the Souper Salad coupons we offer will save you more than the typical senior discount anyway. So make sure to print out a coupon from above before you go! Join the Souper Fresh Club to receive special offers and updates via email. You also earn rewards points that you can turn into dollars off your purchase. For every $1 you spend you earn 5 points. Once you accumulate 500 points that is worth $5 to you. The other cool thing is your Souper Salad rewards card can be used as a pre-paid card or a gift card. The awesome thing about Souper Salad is it is an all you can eat buffet. I know you are thinking about the buffet in the movie Vegas Vacation with Chevy Chase but I assure you it's nothing like that. Souper Salad offers a variety of fresh salads and made from scratch soups as well as delicious breads and desserts. I love Souper Salad because it is the one place I can take my 16 year old son and he actually leaves the place full. Also, it makes me feel good that I can take my family out to a dinner that is healthy. Plus it's always good to save some money with out Souper Salad coupons.